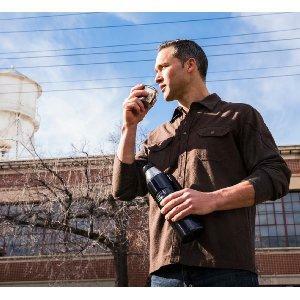 THERMOS brand products deliver what matters every time. 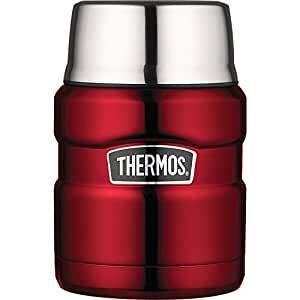 As the leading manufacturer of convenient insulated products for over 110 years, THERMOS is trusted by consumers to provide innovative portable containers that promote a safe and healthy lifestyle. 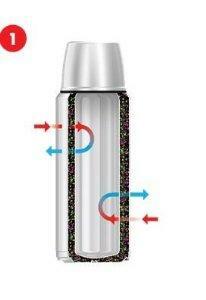 THERMOS delivers when it matters. With traditional containers, heat or cold finds its way inside through the process of convection. THERMOS vacuum insulation creates an airless space between two walls, virtually eliminating the convection process and temperature change. Your drink will stay icy cold or steamy hot no matter what the forecast. Before first use, and as soon as possible after each use, wash all parts with warm, soapy water. Rinse all parts thoroughly and allow time to dry. Contents should not be left in the container for longer than 24 hours. As soon as possible after each and every use, wash all parts with warm, soapy water. Rinse all parts thoroughly with clean water. Allow all parts to dry completely prior to next use or storage. 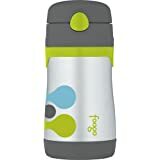 This product is top-rack dishwasher safe; however, hand washing is recommended as the dishwasher uses harsher detergents and hot water that may affect the appearance of your product. Residual liquids, foods, or other contents may become trapped between product components, such as lid parts, container parts, gaskets (flexible band around lid and/or stopper), or straws (if present in the product). Although this product is top-rack dishwasher safe, hand washing is recommended to ensure that all parts of the product are thoroughly cleaned. For maximum thermal efficiency, preheat or pre-chill the product just prior to use. 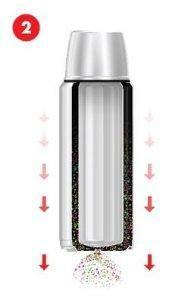 Fill with hot/cold tap water, attach lid, let stand 5 to 10 minutes and empty water. After filling container with contents, re-cover with lid to increase thermal efficiency. Never use a microwave, conventional oven, or other heat source for this purpose. 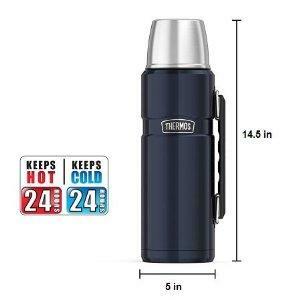 THERMOS L.L.C. warrants this Genuine THERMOS Brand product to be free from defects in material or workmanship for five year from date of purchase. This warranty does not cover ordinary wear and tear or color fading, or any condition affected by abuse, neglect, alteration, accident or improper use or maintenance. See Warranty Section or our website for full warranty. 1. Remove lid-cup (A) by twisting counterclockwise. Then, remove twist-and-pour stopper (B) by twisting counterclockwise. 2. Wash all parts separately. 3. Fill container (C) with contents. Do not overfill: Leave space for the twist-and-pour stopper (B), to avoid overflow. 4. 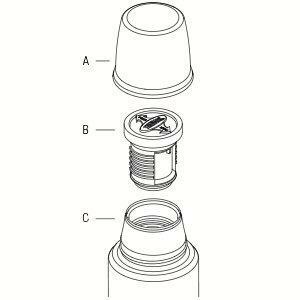 Reassemble twist-and-pour stopper (B) in container (C). 5. 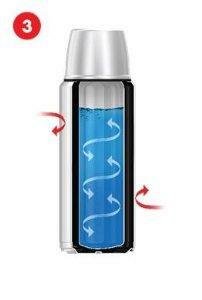 To pour, rotate twist-and-pour stopper (B) counterclockwise ½ - 1 turn. Orient product so pour indicator is pointing down while pouring into lid-cup (A). Note: Twist-and-pour stopper (B) does not need to be removed completely to pour contents. 6. Secure twist-and-pour stopper (B) by twisting clockwise until tightly closed. 7. Replace lid-cup (A) by twisting until tightly closed. 8. After filling, always ensure both twist-and-pour stopper (B) and lid-cup (A) are closed and secured tightly to product. Do not drink directly from container. Do not drink directly from stopper. Do not use product in microwave, on stove-top, or in any type of oven. Not recommended for use by children: Keep out of the reach of children, especially when product contains hot contents, which may burn or scald user. Always test temperature of contents before consuming. Do not overfill the container: Leave space at top of container for lid and stopper (if present), to avoid overflow. Hot contents may burn or scald user if overflow occurs. Check periodically to make sure any gasket (flexible band around lid and/or stopper) is present and properly positioned to prevent contents from passing through stopper when stopper is closed (if applicable to product). Missing, worn or misaligned gaskets may cause product to leak. Leakage of hot contents may burn or scald user. In general, contents should not be left in container for longer than 24 hours. However, the rate at which contents spoil depends on several factors. Certain contents that include, for example, dairy and/or tomato may start to spoil sooner. Proceed with caution when using the product with quick spoiling contents. If contents are left in the container longer than 24 hours, or you suspect spoilage, use caution when opening the container. Contents spoilage can cause pressure inside the container to build, possibly leading to the forceful ejection of the stopper or contents. In such circumstances, before attempting to open the container, ensure the opening is pointed away from the user or other persons to avoid injury. Do not use to store or carry carbonated drinks or dry ice. This may cause lid/stopper and contents to eject forcefully or leak.